Tata Photon plus, EVDO based wireless high speed internet access service (HSIA) from Tata Teleservices introduces new prepaid data plans. Tata Photon plus prepaid plans also includes some unlimited plans, not in true sense as after certain usage on high speed internet speed will be lowered down to 1X speed. 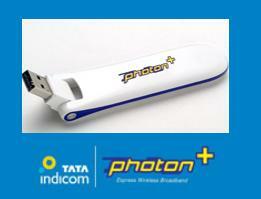 Now Photon+ prepaid packs are starting at most affordable Rs 100. Photon Plus also has unlimited postpaid plans.Tata photon plus’s Huawei-made USB modem is priced at Rs 2399, a little bit higher than MTS or Reliance’s ZTE modem of Rs 2299. Tata Photon plus can deliver maximum download speed of 3.1Mbps and upload speed of 1.8Mbps – in real experience speed remains around maximum 2Mbps which is enough for on-move internet access. Every Photon+ Prepaid activation includes 1GB free data usage for 30 days. There is also a first recharge coupon of Rs 300 that will give you 4GB data usage for 30 days. It is really disappointing that while BSNL reduced its true unlimited data pack tariff on 3G enabled high speed wireless GSM network, and offering unlimited data on EVDO at just Rs 750/month private CDMA operators are showing no sign of being a partner of data revolution in India. tata photon+ is the worst broadband plan i have ever used it in my life it is so much costly as well as useless product it has no speed power what the hell you people doing those who are working for this plan i have called up in customer care and no response have come from there it is my humble request please improrve it otherwise don’t put it in the market.Rather i will suggest the TRAI to stop this Tata photon Plus network once and for all times to come.